Once we have our basic kit purchased, many divers start looking at different accessories they can add. Some go overboard and look like a walking Christmas tree. While it is always good to have a accessory handy when you need it underwater, having to many can impact your buoyancy, mobility and could even become a hazard in a tight space. 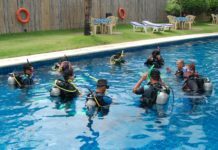 There are a few accessories that you should consider a required part of your kit and have with you on every dive. Entanglement is a hazard that any diver can suddenly find they are facing. 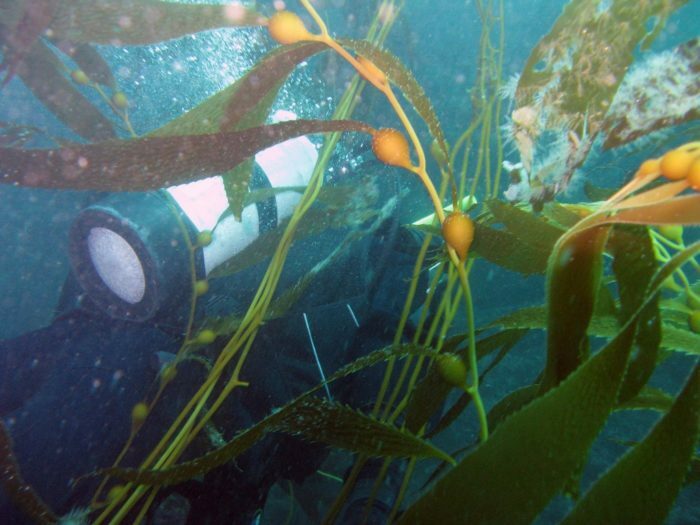 Divers in waters with large kelp can become entangled in it. A discarded fishing line or net may be nearly invisible and can snag a diver that does not see it, and inside wrecks a cable or wiring might snag our equipment. Contrary to the image created by Mike Nelson (Lloyd Bridges) in Sea Hunt and the different James Bonds in various Bond movies, a dive knife is not intended as a weapon but is a cutting tool. 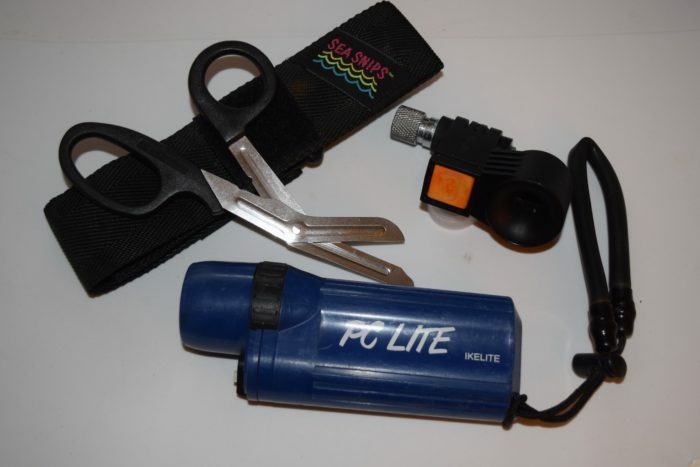 A dive knife has been a recognized part of a dive kit since the early days of recreational scuba diving. Early divers found that commando knifes were perfect for the task that a diver may come upon. They had a serrated edge on one side and a sharp cutting blade on the other. Some of the large size also designed to allow them to be used to pry. While some divers still wear knifes the size of their calf, knifes of many sizes are available. You normally see knifes listed in three groups of sizes, large for over 8 inches, medium also called BC/ pocket knifes are generally between 6 to 8 inches and small or compact knifes below six inches. Knifes come with either a blunt tip or sharp, however, the blunt tip is generally a better choice as it provides a reduce risk of puncturing your BCD or hand. In addition to serrate and sharp edges, there is normally a notch for line cutting. A dive knife is not the only cutting tool that divers use. Many divers use alternative cutting tools, as a diver may encounter restrictions on having a knife. Local laws vary around the world and the dive knife you use at home might be considered an illegal concealed weapon elsewhere. Also you may find that there may be restrictions on placing them in your luggage for flights. Add in that some divers are just not comfortable caring a knife. One of the most popular alternatives are Medical Trauma shears. These tools are designed for use in a hospital and by Emergency Medical Technicians (EMT) in the field. Often called tuffs, toughs, or EMT Shears these shears are designed to cut through clothing, boots, seat belts and even light metals so that an EMT can get to a wound to start treating it. If you are not sure how strong they are, ask a EMT how many pennies they have cut in half. The most common sizes are with 5 ½ and 7 ½ inch blades. The best ones for diving are those that are labeled for autoclave use. An autoclave is used to sterilizer medical tools using live steam under pressure. Medical Trauma Shears that are autoclavable are made from surgical grade (type 316) stainless steel or titanium, and have a stainless steel rivet. Other shears may use a lower grade of metal and a steel pin which can be subject to rust. Despite being a medical instrument the EMT Shears are inexpensive. It is easy to find autoclave quality shears with a case for under $10. Having a Z knife is also a great option. These tools are based on the design military parachutes use to cut parachute cords in an emergency. They are great for cutting fishing lines and small ropes. You may want to consider carrying one of these accessories as well as one of the other cutting tool accessories. I get irritated at sporting events when the idiots run wild with the air horns. They are very disrupted with the loud noises and the only people who seem to like them are the rude people using them. However, I do have something similar each time I dive. I have a air powered horn attached between the low pressure hose and my BCD power inflator. It creates a seriously loud burst of sound when activated and only needs 100 psi (6.9 bars) left in my tank to be heard up to a mile away. I have used mine twice. The first time to warn off a jet skier that was headed to us at a high speed. The second was to get the attention of the boat crew when we surfaced away from the dive boat. Mine is designed for just surface use while there are models on the market that work both above and below the water. My BCD right front pocket is the home of a small flashlight that I carry on every dive. It is useful to look into dark places. It is not very powerful but does provide enough light to see into small crevices and into a wreck from the outside for a short distance. I used to always carry a surface marker buoy, however, I recently changed to a delayed surface marker buoy instead. They both provide similar function, making it easier for someone on the surface to see you. The SMB comes in two forms. They can be a float, often with a diver down flag, attached to a line that a diver carries. 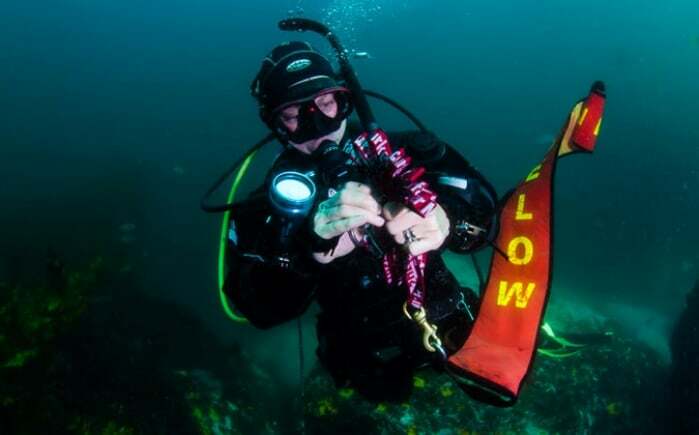 In a number of locations divers are required to have these on every dive, while other locations require them if not with dive boat carrying a diver down flag. The other version is a long tube often called a sausage. These are in bright colors and a diver inflates them at the surface holding one end underwater. The Delayed Surface Marker Buoy is similar in design to the sausage style SMB. The difference is that they are designed to be inflated underwater and released to the surface with a line being held by the diver.  Once a tool of an technical diver, they are becoming widely accepted by all recreational divers. The advantage of the DSMB over the SMB is that the diver can release it while at a safety stop to show where they are and signal their intention of surfacing. As they are visible before the diver reaches the surface there is additional time for the boat crew to react. This can be important in strong currents. It also alerts other boaters and personal water craft operators that you are in the water. 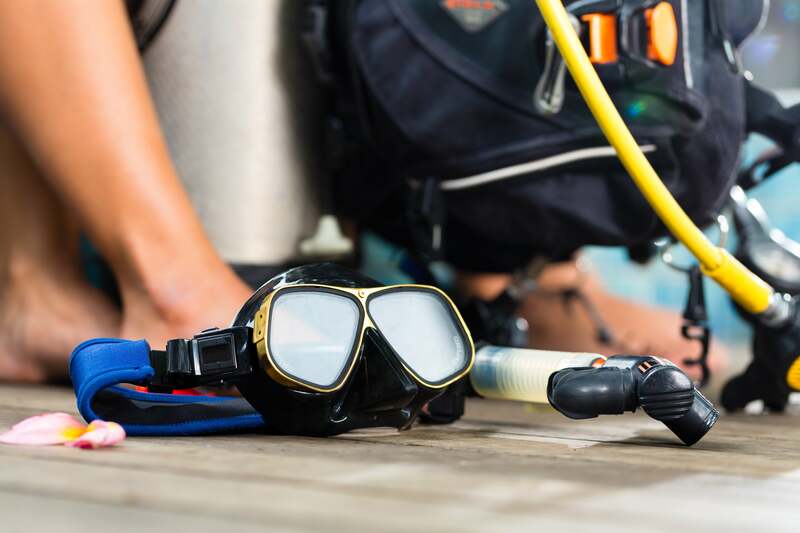 Other accessories may be needed or desired depending on the nature of the dive and dive site, however, I believe these items should be carried on all dives.